We’re curating for you a tasty collection of game day dishes that should also have a place in your Thanksgiving rotation. This blog should be credited to one of our core Hungry Fans on Instagram. He asked us for some Thanksgiving recipes. And since we really try to stay on-brand with game day-only recipes (foods that can be enjoyed while tailgating & homegating), we quickly realized that many of our favorite game day recipes also make for great holiday recipes. In fact, another one of our super engaged Hungry Fans messaged us after National Deviled Egg day to give us props and tell us how much he loves deviled eggs—that they are his mother’s specialty and she serves them at Thanksgiving and Christmas. (Lucky family, if you ask us)! So we have pulled together some of our favorite recipes that you can find on our site (and one from The Hungry Fan’s Game Day Cookbook) to make a curated menu of delicious recipes that we’d be very proud to serve our families at Thanksgiving—or in the days after when mastering the art of repurposing leftovers is a skill that is celebrated by all. Deviled eggs are absolutely a hit basically anytime, anywhere. We just had some for brunch just because. They’re a great finger food and they’re easy to make ahead, store in the fridge and then serve when the family arrives. Turn on some football or college basketball and most everyone will be more than happy to hang out until it’s time to carve the turkey. Looking to jazz up the regular deviled eggs recipe and get a lil fancy? Read this. It’s a rare occasion when we come across someone who doesn’t like tater tots. They’re fantastic finger food, all crunchy on the outside and warm and mushy on the inside. Sure, there’s a good chance there’ll be a lot more spuds (mashed potatoes or yams anyone?) at the Thanksgiving table, but it’s basically a national diet cheat day so hakuna matata. Besides, a few tots won’t load you up too badly. Ooooh pimento cheese dip, how do we love you? Let us count the ways. And then the added bonus of bacon!? Who needs Thanksgiving dinner!? Just give us a bowl of this stuff and the remote control and we are happy campers. Seriously. This stuff is beyond delicious. Pro Tip: Ok. We know what we just said. We were being serious but also hyperbolic. Despite what we just said, someone worked super hard on your Thanksgiving dinner—likely for hours—so don’t fill up on this too too much. Leave some room for that beautiful turkey and all the yummy sides. Just saying. It’s kind of like the best of both worlds when it comes to potatoes, which are absolutely a must (and are gluten-free!) on Thanksgiving. You get the baked potato and the super creamy mashed potatoes. And in this case, one is set nicely and neatly into the other. (Bonus presentation points)! The added taste factor here is barbecue. While you might not immediately associate barbecue with Thanksgiving, it’s a flavor most everyone loves. So why not incorporate it into your holiday meal? Brussel sprouts have grown in popularity in the last 5-10 years in such a way as to blow the mind. We remember when they were the most disgusting vegetable—if not food— basically on Earth when we were kids. Now they’re on every menu, mostly likely including your Thanksgiving Day menu. Here’s a tasty spin on it, bacon optional. (For us, however, bacon is never an option. It’s a necessity). Corn is such a Thanksgiving food. Personally, we love squash soups at Thanksgiving. But a great corn soup alongside our meal—or even to start it—is lovely too. If you’re looking for a different corn recipe this year, consider this one. It’s got some kick, some color and good texture. Pro Tip: While the recipe doesn’t call for it, you can purée the ingredients into more a squash soup-like texture, rather than serving it more brothy with floating veggies. After Step 5, let it cool and then transfer the mixture into a food processor (a little at a time). Return it to the pot and reheat before serving. (The soup can be made ahead and stored in the fridge until it’s time to reheat. No problem). Yes, that is a turkey that is wrapped in a bacon weave. Your eyes are not deceiving you. I got this recipe from my friend Anthony Spice Adams who played defensive tackle at Penn State and then went on to play in the NFL for several years. He might be most famous now for his hilarious Instagram posts, winning Chicago’s version of Dancing with the Stars, his amazingly enormous personality and his work on The Big Ten Network. When I wrote my game day cookbook a couple years ago, Spice was kind enough to lend me a recipe. The fact that the recipe contained bacon came as no surprise. He’s certainly a good eater, he enjoys food and he is known for wearing an I ❤️Bacon t-shirt from time to time. 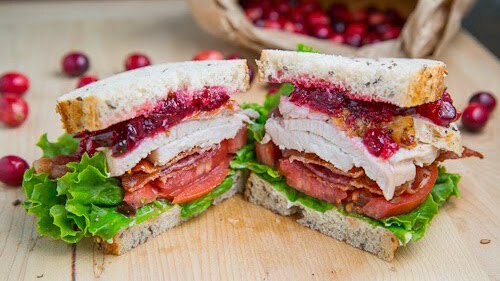 Don’t let the use of bacon in the recipe deceive you though—the majority of the flavor comes from a very tasty turkey preparation. That plus the bacon—together—is an incredible texture and flavor combo that your Thanksgiving guests will love. In fact, they may love it so much that this could easily become your go-to Thanksgiving turkey recipe for years to come. So, yes, there’s always the usual. Pumpkin pie. It’s hard to argue that it’s played out, though, since we only eat it like once a year…at Thanksgiving. That said, if you’re looking for a pumpkiny something to serve that isn’t pie, we offer up this recipe. It’s easy to make in advance. You can serve warmed (it just needs a little warming in the oven before serving) or at room temp. And it’s great to send people home with should everyone be a little overstuffed to eat dessert. (This happens basically every year at our holiday celebration). Each bar can be individually packed or wrapped in plastic wrap and sent home with your family. Piece of cake…errr…cookie bar. Plus, these bars have some great texture to them, which we find to be more fulfilling than pumpkin pie. Just our two cents. Here’s why we like this recipe over store-bought pumpkin pie: it’s really creamy, it’s got a kick (we make our crust with ginger snaps! ), and the flavors in the pumpkin part are pretty amazing because we use our own pumpkin spice blend (which rocks if we don’t say so ourselves). Top the pie with some whipped cream (and a sprinkling of cinnamon or nutmeg) and this takes pumpkin pie to a place you didn’t know it could go. And it cooks in just 35 minutes! (We usually prep it the day before and then bake it during dinner clean-up to give everyone an eating break). We always have leftover cranberry sauce. It seems like maybe it’s not everyone’s favorite when lumped onto the plate. But tucked into a delicious club? Yessssss! It works. Add some turkey, LTO and bacon, of course, and you’ve got a killer meal. You can always build it up like a proper club sandwich, with an additional slice of bread and doubled up fillins’. Up to you. We like ours on rye. You do you. Just know you’re getting a delicious lunch in the days following Thanksigiving. You’ve heard of tuna salad…and chicken salad? Well why the heck not turkey salad? Goodness knows you’ve probably got a ton left over after Thanksgiving dinner. This isn’t a remarkably novel recipe, nor is it difficult to make. But it's a great staple to have in the fridge for those looking for something with which to make an easy lunch or snack. (Think of it like this: if you have house guests and you’re tired because you spent days cooking them Thanksgiving dinner, you’re not exactly jumping at the opportunity to get back into the kitchen. You don’t really want to be responsible for preparing any further meals, amirite? We got you. If you prep this after dinner, while everyone else is cleaning up, you can throw it in the fridge and your guests will have something tasty to make sandwiches with the next day. And you don’t have to lift a finger).